"This recipe is out of my great-grandmother Bertha Iva Steinbeck's recipe box. She really was John Steinbeck's aunt. She lived in Hollister, California, and died in the '30s. I've been making this since I was about 5 years old when my grandmother, Agnes Steinbeck Bowman decided I was old enough to learn to cook. It was actually the second thing I learned to cook...she wanted to see how I handled scrambled eggs before she introduced me to something that demanded some technique! I've never tasted better cornbread in my 47 years." Preheat the oven to 400 degrees F (200 degrees C). Grease an 8 inch glass baking dish. Sift the flour, cornmeal, sugar, baking powder, baking soda and salt into a large bowl. In a separate bowl, whisk together the buttermilk, corn oil and egg. Pour the wet ingredients into the dry ingredients, and mix just until blended. Pour into the prepared pan, and shake gently to level it out. Bake for 30 minutes in the preheated oven, or until a knife inserted in the center comes out clean and the top is golden brown. Serve hot. Just with butter will do, it is plenty sweet enough! 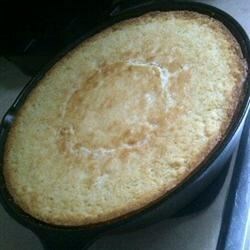 This is a great cornbread recipe. It came out fluffy and it was not sweet. I love it. I did not have buttermilk so I just used the milk I had on hand. Thanks for the recipe.